This does not happen very often. Yesterday I transferred the day's pictures from my memory card to my computer and looked at the thumbnails of a handful of what I thought were loser images. Then I sent one image through a post-processing preset that I like a lot and - bam! - magic happened. Finally, I played with the above image a bit to get it to look just how I wanted it. I like how the reflections of the buildings in the background look like Hundertwasser architecture. This was a case of discovering something in a photograph that I had not foreseen. Nowadays I often know exactly how I'm going to process a picture that I take. In this one, I knew the reflection was interesting and I wanted the old woman in the picture (so I only had time to take four shots), but the possibility of drawing out the buildings in the background (by increasing the blacks and the contrast) was a nice surprise. 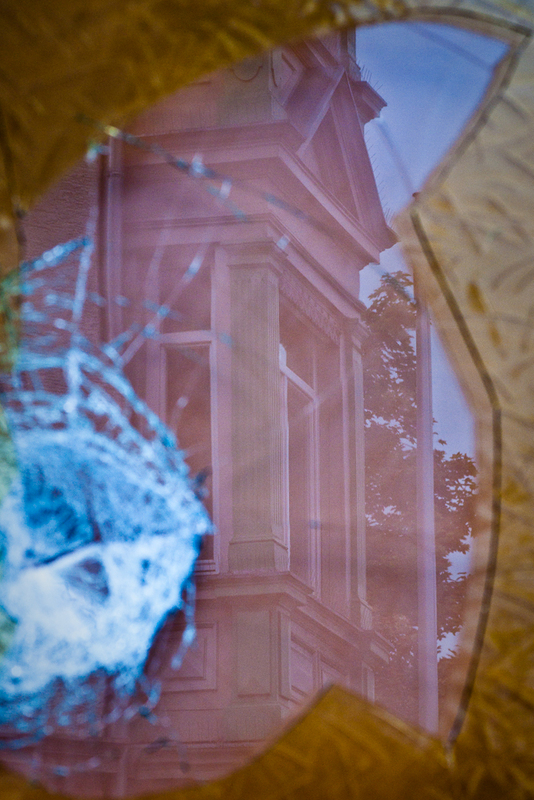 This is another reflection, but one I had a bit more time to prepare because the buildings weren't going to walk away anytime soon. What I like about this one is the frame effect of the broken glass and the appeal of the contrasting architectural styles. The yellow contoured glass from a bar in Esslingen is typical of the late 1970s. Juxtapose that with the bay window of the building from the early 20th century and you get a nice contrast. 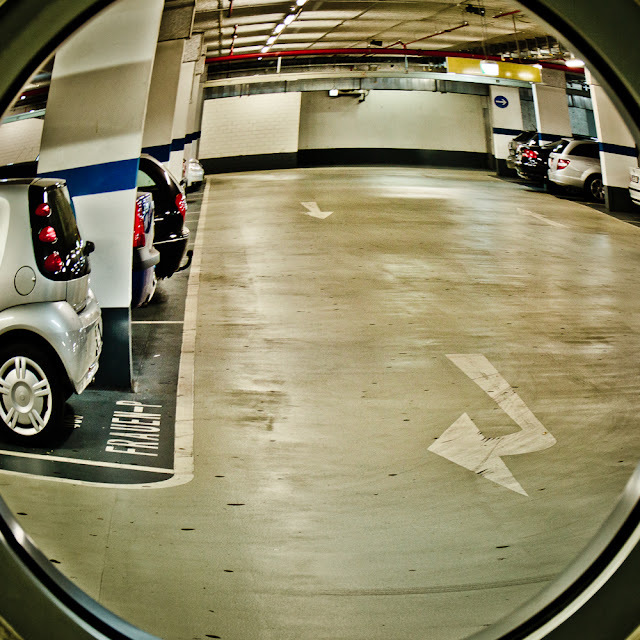 During the same trip to Esslingen (with my friend Christian) I took a shot through a round window looking into a parking garage while I was waiting for him. Using the new lens correction feature from Lightroom 3, I made this one look like a super wide angle shot. This shows what can be done with post-production to make everyday shots more interesting. Taking the advice of Chase Jarvis, I tried to get some good shots within a few meters of where I was sitting (in my office) one evening. While some photographers will tell you that if you want to get more interesting pictures, you have to become a more interesting person (that could take a while! ), and others will tell you to put something more interesting in front of your camera, Chase suggests you can take interesting pictures wherever you are, assuming you have a camera with you (he is a fan of the iPhone's photo capabilities) and that you have a good eye for images. I always carry my big camera with me, but you can take great shots with a small one, too, if you have your eyes open. My friend Jim Palik says there are a lot of people out there taking great pictures but 95% of them don't know what to do once they've taken it. In other words, their post-processing skills are weak and/or they don't know how to share them. So there I was in my basement taking pictures one evening. I took a lot of pictures - one too many pictures, as it turned out. I was recording to a 2GB Memory Stick (originally developed and now exclusively used by Sony, of course) and it filled up before I noticed that it had counted down to 0. When I copied the pictures to my hard drive, the last 50 pictures were corrupt and had purple tinges and stripes in parts. The picture above is almost interesting in a technical, never-seen-that-before way. It is not too frustrating to have corrupt pictures of your CD collection. However, I had this problem at a friend's 40th birthday and again one day when I was visiting my father with my children. The problem is that the pictures look fine on the camera's monitor, but when you copy them onto the computer, you have either gray parts or stripes with either a purple tint or white noise. I've only had this problem with the Memory Stick, but perhaps that is because in each of the cases that was my back-up card and it, too, filled up. So - never shoot a card until it is totally full (unless you like purple stripes)! The little computer processor in your digital camera needs a bit more room to write the files to the card than you think it does. Remember the lovely analog days when accidents could also happen to ruin your pictures? The film didn't catch when you loaded it (happened to a friend of mine before he went to meet his idol John Williams the conductor. [Now he's making movies with him in Hollywood, so things worked out in the end!]). Or you ripped up the film forcing it back into the spool (happened to me more than once). Or the back of the camera opened and exposed your film (happened to everyone). By the way, the picture above is more of what I was trying to do that evening. 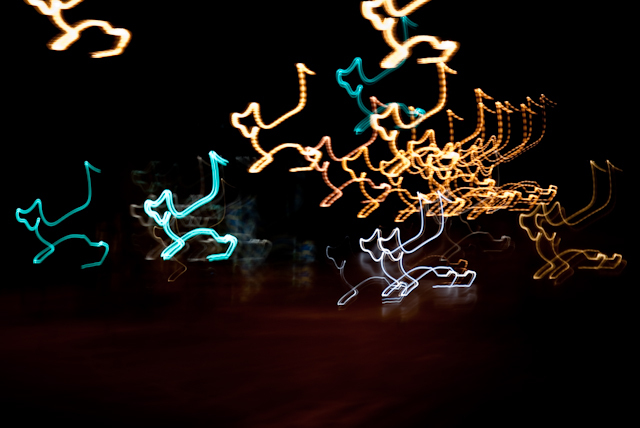 I used a slow shutter speed and moved the camera once while the shutter was opened. It is sort of like a double exposure. Some DSLRs can take multiple exposures, but mine can't. Of course, you could simply place one layer over the other in Photoshop, but I don't to that (yet). I'll end with one more bit of magic. Walking back home one evening, I used a slow shutter speed (about 2-3 seconds) and let the streetlights capture my gait. It appears that I walk like a cat!